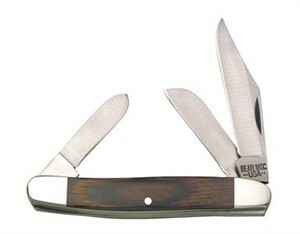 Built for work but good enough for show, the Bear & Son 247R Rosewood Large Stockman knife holds three important blade styles. Originally developed to suit the needs of frontier wranglers and farmers, the blade selection is just as practical for those of us who no longer work with cattle and horses. The main blade of the Bear & Son 247R is a strong hollow ground high carbon stainless steel clip point. The hollow grind makes it easy to keep a razor edge on this, but save it for the fine work where you need smooth and controlled slicing action. For prying pebbles out of horse's hooves or car tires, the shorter and stouter flat ground spey blade would do better. For flush cutting of plug tobacco, or possibly even opening boxes at the warehouse, choose the straight edge and sharp point of the sheepsfoot blade. All three blades are slip joint types which don't actually lock in the open position. Spring bars in the spine of the handle keep open blades open and closed blades closed, but release with a firm pressure. That's always a good thing to keep in mind when using a slip joint pocket knife, because pressure on the spine of the blade folds it up even if your fingers are still in the way. The old thumb notch opening system requires two hands, and some new knives need a little oil and use before the action is just the way you want it. All three stainless steel blades are mirror-polished as well as the nickel silver double bolsters bracketing the rosewood-slab handle. Four inches when folded, the Large Stockman isn't too large for the pants pocket, but it's at the edge of what's practical for rolling around with the pocket change. Entirely American-made, all parts for the Stockman knife were fashioned in Bear & Son's Alabama facility.